Nearly 1,000 Artworks have already arrived from all around the globe! Rochester Contemporary Art Center‘s (RoCo) international small art phenomenon returns with thousands of original artworks, made and donated by celebrities, international & local artists, designers, college students, youths, and YOU. Each artwork must be 6×6 square inches (15cm) or mounted to a 6×6 board, and signed only on the back, to be exhibited anonymously. All entries will be accepted, exhibited and will be for sale to the public for $20 each (in the gallery and online for global purchasing) to benefit RoCo. 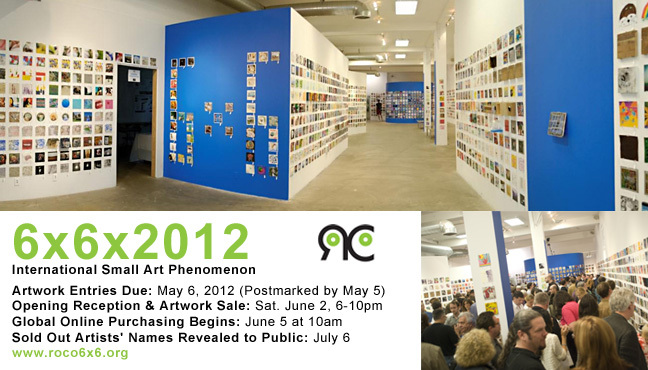 Artist names will be revealed to the buyer upon purchase and all artworks remain on display through July 15, 2012. Sold Out artists’ names will be revealed next to their work online on July 6. Anyone may enter up to 10 artworks of any medium (2D or 3D) and there is no fee to enter. Join our celebrity contributors and be a part of this global small art event…send your artworks early! Last year’s exhibition included 5,000 artworks by 2,000 artists from 50 US states and 36 countries! Over 7,000 people attended 6x6x2011 and over 1,700 artworks were sold! Past contributors have included Bill Viola, Dexter Dalwood, Jerry Uelsmann, Wendell Castle, and many more. This year’s exhibition will introduce the new RPO Bravo Award (A collaboration with Rochester Philharmonic Orchestra) for which all entries will be eligible. New partnerships with It’s Liquid and Professional Artist Magazine bringing even greater international visibility to 6×6. Nearly 1,000 Artworks have already arrived from all around the globe! Early Celebrity Artist entries have already arrived from Thich Nhat Hanh, Vietnamese Buddhist monk, teacher, author, poet and peace activist; Garth Fagan, choreographer, founder and artistic director of Garth Fagan Dance; Robert Marx, internationally renowned artist; Tom Otterness, NYC-based sculptor; Lorenzo Fonda, Italian film director; Steve Gadd, influential drummer; US Congresswoman Louise M. Slaughter; Andrea Barrett, novelist and short story writer and many others. Join these celebrities and artists and send your artwork early!